UNITED NATIONS, April 9 -- In September 2009, a conference about Darfur was convened in Addis Ababa, Ethiopia by the joint United Nations - African Union mediator, Djibrill Bassole. 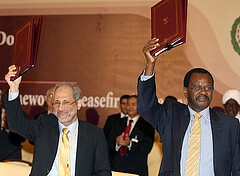 The goals included uniting various Darfur rebel groups under one umbrella to negotiate with Omar al-Bashir's National Congress Party, and replacing the leader of the Fur ethnic group and Sudan Liberation Movement/Army, Abdul Wahid Mohamed al Nur who refused to negotiate until his Fur people were not threatened with violence. Conveniently, an alternative Fur leader emerged, offering to stand in for Wahid al Nur and to lead the umbrella group and make peace with al-Bashir: El-Tigani El-Sissi Ateem (sometimes written "Al-Tijani Al-Sissi"). The UN-AU's Bassole embraced Al-Tijani Al-Sissi Ateem. But Al-Tijani Al-Sissi Ateem was at that time, and had been since 2005, a paid UN staff member, of the UN Economic Commission for Africa also based in Addis Ababa. In the run up to Sudan elections, sources told Inner City Press that compliant Darfur rebel leader Eltijani Elsissi Ateem was paid by the UN from 2005 through March 8, 2010. Inner City Press asked and wrote an exclusive story on March 28; UN staff say that Bassole was asked. 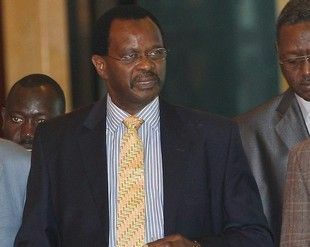 On April 8, Sudan's Ambassador to the UN told Inner City Press that Eltijani is a "long time Darfur leader" who, as a convenient replacement for Fur leader Abdul Wahid Nur signed a deal with Omar al-Bashir's National Congress Party. Video here. Eltijani did this work while being paid by the UN, in violation of UN staff rules. Some now question the UN's role in replacing one Fur leader with another, paid by the UN. The UN in New York has so far sought to dodge all of these questions. Twice Inner City Press has asked in UN noon briefings in New York, then in writing, but was referred to the UN Economic Council for Africa in Addis Ababa, the UN unit which employed Eltijani. What were El-Sissi’s official job responsibilities for the UN system? Was the UN aware that El-Sissi was a member of the Umma Party? Was his travel to Doha, Qatar in February funded by the UN? Was he on official business, or annual leave at this time? Were the activities of the “Addis Ababa Roadmap group” supported, facilitated, or participated in by the UN? Did any meetings of the “Addis Ababa Roadmap group” take place on UN premises? ECA questions: To what extent did or does UNECA have responsibilities relating to the unification of the Darfur armed groups and development of a common position and a common negotiating team or the contribution in the development of a road map for the resolution of the Darfur conflict? Was the Head of UNECA aware of Mr. El-Sissi’s activities in the Darfur process while he was employed by the UN? How long was El-Tijani El-Sissi employed by the UN? Mr. Eltigani Ateem started working for ECA on 10 February 2005 as Regional Advisor. Regional Advisory Services are made available upon request to Members states, sub-regional and continental organizations on socio-economic and political challenges. In his capacity as Regional Advisor, Mr. Ateem, upon request of the Head of State of Libya, then Chair of the African Union (AU), to ECA's Executive Secretary, was asked to serve as resource person and help support the joint AU-UN efforts in addressing the Darfur conflict. As part of this process, Mr. Ateem traveled to Doha, Qatar in February 2010. This travel was not funded by ECA. This initiative followed earlier involvement of Mr. Ateem who, at the request of the World Bank, served as a member of the Advisory Panel on Darfur Joint Assessment Mission in 2006. ECA did not support, facilitate or participate in the activities of the “Addis Roadmap Group” and no meeting of the “Addis Roadmap Group” took place on ECA premises. ECA is not aware of Mr. Ateem’s political affiliations. ECA has no responsibility related to the Darfur Negotiations. A UN source, when told of the response that Mr. Al-Sissi's political affiliations were unknown, burst out laughing. At the April 9 UN noon briefing in New York, Inner City Press asked Associate Spokesman Farhan Haq which UN units were involved in work to unify the Darfur rebels: the Department of Peackeeping Operations under Alain Leroy, the Department of Political Affairs under Lynn Pascoe, or other UN units, like Bassole's? Haq acknowledged that to do political work while paid by the UN violates staff rules. But he said he would have to check which UN units were involved. There is no question that Bassole's UN-funded unit was involved. That Bassole was asked about Al-Sissi's status only confirms it. That Bassole's office is funded by the UN is demonstrated in para 6 of A/63/717 (dated 17 Feb 2009; "Budget for the African Union-United Nations Hybrid Operation in Darfur for the period from 1 July 2009to 30 June 2010"). 6. The Joint Mediation Support Team is supported by UNAMID. The Joint Chief Mediator, who is the head of the Team, reports to the Secretary-General through the Under-Secretary-General for Peacekeeping Operations and to the Chairperson of the African Union Commission through the Commissioner for Peace and Security. The Joint Chief Mediator liaises closely with the Joint Special Representative for UNAMID, the Special Representative of the Secretary-General for the Sudan and Head of the United Nations Mission in the Sudan (UNMIS) and other relevant stakeholders. The Joint Chief Mediator is entrusted with leading the mediation efforts between the parties to the Darfur conflict with a view to bringing them to peace negotiations. The Chart on page 82 of this document (A/63/717) shows that under Bassole, he has 39 positions located in Addis, including 1 D-2, and 1 D-1. One wonders how Mr Ateem fits into this. Also, S/2010/151 (Letter dated 23 March 2010 from the Permanent Representative of the Sudan to the United Nations addressed to the President of the Security Council), dated 24 March 2010. It includes a photocopy of the signed Doha agreement, which includes Eltigrani Ateem's signature. Interestingly, he uses yet a different version and spelling of his name: "Dr. Tejani Sisei Mohammed Ateem"
The African Union-United Nations Joint Chief Mediator, Djibrill Bassolé, met with the Tripoli Group (comprised of five rebel movements) in Sirte, Libyan Arab Jamahiriya, from 28 to 30 June to discuss the possible participation of the Group in the Doha negotiations. The mediation also held broad consultations in Darfur, Khartoum and Tripoli with representatives from Sudanese civil society, non-governmental organizations and tribal leadership to underline the intention to broaden participation in the Darfur peace process. 69. As the political process gains momentum, and in order to build on the significant work of the Joint Chief Mediator, Djibrill Bassolé, to increase engagement among the parties to the conflict, I urge all parties to cease armed confrontation and engage in a meaningful way in substantive, inclusive discussions. 71. In the context of the political process, it is critical that the national elections scheduled for April 2010 provide an opportunity for all Darfurians, particularly internally displaced persons, to participate fully and completely unhindered. 1. You say that Mr Ateem's travel to Doha in February 2010 was not funded by the UN. Who funded it? Were Mr Ateem's salary and benefits during his tenure as a UN employee from February 2005 to March 2010 funded by the UN, and if not, by whom? 2. Who was Mr. Ateem's reporting officer, viz to whom within ECA was he responsible? 3. Is ECA responsible for or does it take any credit for unification of the Darfur armed groups and development of a common position and a common negotiating team, or contributing to the development of a road map for the resolution of the Darfur conflict, or are these tasks which UNECA has nothing to do with? While awaiting answers, and accountability, note that the UN is now doing all it can to dodge from the fact that for five years its Addis office employed as a staff member a former governor of Darfur who is also a significant figure in Sudan's Umma party. This individual, Mr. Eltigani Ateem, who while serving as a UN staff member in the "NEPAD and Regional Integration Division" of the Addis-based UN Economic Commission of Africa, was assigned official responsibility for promoting the unification of Darfur armed groups and for developing a Darfur Road Map. This raises significant questions about the staff selection and assignment practices of the UN, which we've seen before. Is it appropriate for a former [and current] national political figure to be assigned work directly related to his own country? 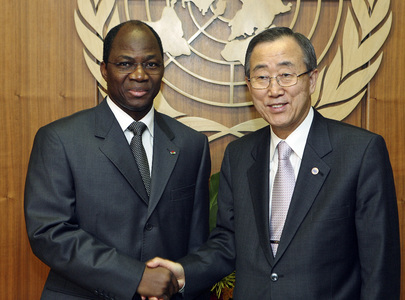 Ibrahim Gambari, the UN's new envoy to Darfur who confirmed to Inner City Press that Al-Sissi worked for ECA, fell under fire for taking a leave to attempt to mediate disputes in the Niger Delta of his native Nigeria. But Al-Sissi was getting paid by the UN while moonlighting as a rebel leader in his native Sudan. For their part, the UN is employing normal avoidance tactics in response to Inner City Press' questions. First, the SG's assistant spokespersons refused to even accept numerous questions, deferring to UNECA's media shop. After a time, UNECA finally responded, denying not only knowledge of Mr Ateem's political baggage, but also that UNECA had any role in supporting the "unification of armed groups" or the "road map." Result 2: Development of a set of policy recommendations for post conflict reconstruction and development in areas and countries emerging from conflict, with particular emphasis on Darfur; Unification of the Darfur armed groups and development of a common position and a common negotiating team; Contribution in the development of a road map for the resolution of the Darfur conflict. After the DPA was partially signed by one faction of the SLM in May 2005, some neighbouring countries introduced further polarisation within the rebel movements, something that has seriously jeopardized the AU/UN-led efforts to resuscitate the peace talks with the non-signatories. However, just two years later, at in late 2009 talks in Doha, Mr. Ateem expressed his qualified interest in becoming the leader of a unified Darfur rebel organization, reportedly stating "I'm ready to lead the new movement if all of you commit yourself to a real and strong unity." The UN's Mr. Ateem finally got his wish in February 2010, UN/AU Mediator Djibril Bassole proudly (and rather strangely) announced Mr. Ateem's leadership of a unified Darfur rebel structure, and that this should "pave the way for holding constructive dialogue and setting frameworks for detailed negotiations that would lead to reaching a peace accord." Bassole has already said he wants to leave his UN post. But that will not resolve the matter. Who knew what, when? Watch this site.